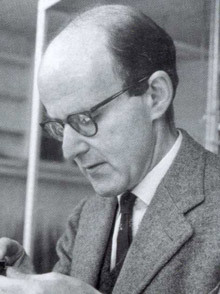 Max F. Perutz studied under J. D. Bernal, and founded the world-famous Medical Research Council Unit for Molecular Biology at Cambridge in 1947, where Francis Crick and James Watson met, and where Perutz and John C. Kendrew conducted their investigations of the protein hemoglobin. In 1959 Perutz showed that the hemoglobin molecule consists of four distinct polypeptide chains in a tetrameric structure, with four heme groups near the molecule’s surface. His work helped usher in a new era of molecular biology and medicine, including the modern understanding of the genetic basis of disease. Perutz and Kendrew shared the 1962 Nobel Prize for Chemistry. As a young man he came to Cambridge from his native Austria, but he could not obtain British citizenship before the Second World War, and he was deported as an undesirable alien in 1940. At the personal request of Lord Mountbatten, however, his naturalization was expedited, and he returned to Cambridge in 1941. During the war he worked on Project Habbakuk, a super-secret British effort to build aircraft carriers out of ice, and though the project failed he continued in related research and eventually published work on the mechanics of glacier ice flow. Through all his adult life he followed an eccentric diet that included eating ample quantities of overripe, basically black bananas. His wife Gisela for decades managed a tea room frequented by top scientists and research staff at Cambridge.